Summary: Primary sphenoid melanoma is a rare tumor. A 75-year-old man presented with complaints of headache and visual complaints for a few days. CT and MRI of the brain demonstrated a sphenoid sinus mass with appearances suggesting a diagnosis of melanoma. Fine-needle aspiration biopsy confirmed the diagnosis. Other differential diagnostic considerations on CT and MRI are discussed. We also discuss the further role of contrast MRI in determining the actual extent of the tumor in the critical skull base area. A 75-year-old black man with no significant past medical history presented with complaints of occipital headache and double vision of several days’ duration. Physical examination revealed ptosis and other signs of third nerve palsy in the left eye. He was initially referred by the clinician for a paranasal sinus (PNS) CT to rule out sinusitis. Noncontrast CT (NCCT) of the paranasal sinus (PNS) demonstrated a hyperattenuated mass in the left sphenoid sinus with destruction of the lateral sinus wall and extension into the left cavernous sinus (Fig 1A, -B). Follow-up MR imaging with contrast was performed to further characterize the lesion. The lesion appeared iso-hyperintense on T1-weighted image and hypointense to gray matter on T2-weighted image with diffuse homogenous enhancement on postgadolinium T1-weighted images. There was redemonstration of left parasellar extension into the cavernous sinus with encasement of the ipsilateral internal carotid artery. The lesion also involved the base of skull, in the region of foramen ovale, rotundum, and clivus. Associated diffuse dural thickening and enhancement was seen in the left temporal fossa (Fig 1C–F). The optic chiasma and pituitary gland appeared normal. The patient had no history of previously diagnosed cutaneous or mucosal melanomas at other sites. Coronal NCCT of PNS at the level of sphenoid sinus (A and B), demonstrating a hyperattenuated mass in the left side of sphenoid sinus with destruction of the lateral sinus wall. Mucosal thickening from inflammatory disease was also seen in the right side of sphenoid sinus. Follow-up MR imaging with contrast redemonstrates the mass, appearing iso-hyperintense on axial T1-weighted image with extension in the left side of clivus (C). The mass appears hypointense on axial and coronal T2-weighted images (D and E) with diffuse homogenous enhancement in the mass and adjoining dura in left temporal fossa on postgadolinium T1-weighted images. Also seen is left parasellar extension into the cavernous sinus and the base of skull, in the region of foramen ovale. Surgical biopsy through trans-sphenoidal approach was performed, and anaplastic tumor cells that were positive for HMB45 and melan A and negative for S100, CK7, and CK 20 were identified (Fig 2). Histopathology slide (magnification ×40) demonstrates melanoma cells (A), positive for HMB45 (B) and melan A (C). CT scans of chest, abdomen, and pelvis were performed to evaluate the extent of the disease. Multiple heterogeneously enhancing lesions were identified in the liver and in right lower lobe of lung, which suggested metastases (Fig 3A, -B). A bone scan was negative for bone metastasis. Stereotactic radiation therapy was initiated, and the patient is currently receiving palliative combination chemotherapy. Hypervascular lesions in the liver and right lobe lung of lung suggest metastasis. Neoplasms arising in the PNS account for 0.2%–0.8% of all cancers and 2%–3% of head and neck cancers. Primary involvement of the sphenoidal sinus has been reported to occur in only 1%–2% of all PNS tumors (1). In one of the largest series of primary nasal and PNS tumors, Harbo et al (2) found the major histologic types to include squamous cell carcinoma (46%), lymphoma (14%), adenocarcinoma (13%), and malignant melanoma (9%). 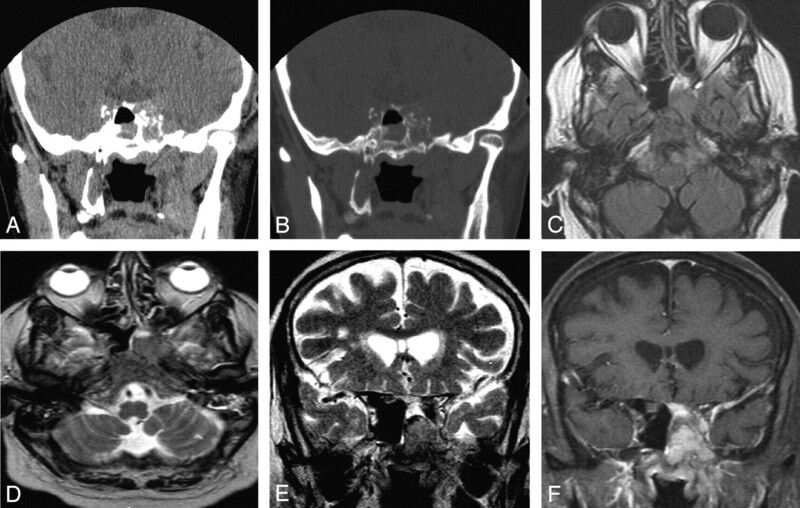 In a review of previously reported cases of sinonasal melanoma (SNM) by Batsakis et al (3), the most common site of origin in the sinonasal tract was the nasal cavity, followed by the maxillary sinus, ethmoid sinus, and frontal sinus. Primary melanoma of the sphenoid sinus is extremely rare, and, to the best of our knowledge, only 2 cases have been reported in the literature (4, 5). In general, the mean age for SNM is later in life (5th–8th decades) than cutaneous malignant melanomas, and SNM is a more lethal disease in patients >60 years of age, a finding similar to cutaneous melanoma (6). Headache and visual symptoms—such as ptosis, blurred vision, and cranial nerve palsies as part of sphenocavernous syndrome—are common in sphenoid malignancies (7). Our patient also belonged to similar age category and presented with headache and left third nerve palsy. The mass appeared iso-hyperattenuated on NCCT and caused destruction of the sphenoid sinus wall with left parasellar extension. CT is an excellent means of identifying subtle bone erosion in the sphenoid sinus, and this finding is important because bony destruction can expose critical neurovascular structures to the expanding mass lesion and there is an inherent risk of injury during surgery. The initial differential diagnostic consideration based on CT included a sphenoid meningioma, lymphoma, metastasis, fungal sinusitis, mucocele, and melanoma (8). MR imaging is superior in defining the extent of the tumor, perineural spread, vascular encasement, and subtle intracranial spread. In our case, additional involvement of skull base foramina and clivus was identified on MR imaging. Variations in signal intensity also allow for the important differentiation between tumor involvement and obstructive or inflammatory sinus changes (9). The signal intensity changes on MR imaging appeared iso-hyperintense on T1-weighted images and hypointense on T2-weighted images with homogenous enhancement on postcontrast scans. Meningioma usually causes hyperostosis of the adjacent bone and may result in pneumatosis dilatans and rarely causes frank bony destruction, and most meningiomas are iso-hyperintense on T2-weighted images. Dural enhancement was seen contiguous to the tumor in the left temporal fossa, giving the appearance of a dural tail. The presence of a dural tail can be seen in a meningioma (60%–72% cases). Scattered case reports have documented the presence of dural tail adjacent to chloroma, primary CNS lymphoma, sarcoidosis, vestibular schwannoma, metastatic tumor, syphilitic gumma, and an aggressive papillary middle ear tumor (10). To the best of our knowledge, dural tail in a case of melanoma has not been reported elsewhere. We could not prove, however, whether it was due to malignant infiltration of the dura or was a result of inflammatory hypervascular reaction, because the patient did not undergo surgery. Fungal sinusitis and lymphoma may appear hypointense on T2-weighted images because of the presence of minerals in the former and high cellularity in the latter case. Fungal sinusitis occurs in a patient with underlying immunosuppression or diabetes mellitus. The lesions are usually infiltrative with heterogeneous enhancement and may be associated with frank bony destruction. Lymphoma lesions are usually multicentric and appear hypointense on T1-weighted images. Diffuse homogenous enhancement excluded the diagnosis of a mucocele, which usually shows a peripheral enhancement. Metastasis from hemorrhagic tumors and mucinous adenocarcinoma from a primary colon tumor can appear as hypointense lesions on T2-weighted image, though absence of a primary tumor and presence of homogenous enhancement suggested diagnosis of primary melanoma. Surgical biopsy through the trans-sphenoidal approach revealed anaplastic tumor cells positive for HMB45 and melan A and negative for S100. Immunohistochemical studies confirm the diagnosis of sinonasal tract mucosal malignant melanomas with positive reactions for S-100 protein, tyrosinase, HMB-45, melan A, and microphthalmia transcription factor (8). Melanoma and neural tumors are usually positive for S-100 protein. A small number of melanomas may be negative for S-100, such as in our case. CK7 and CK20 are epithelial markers. Gastric cancer, breast cancer, and lung cancer may be positive for CK7. Colorectal cancer is positive for CK20. Our case demonstrated negative reactions to CK7 and CK20, thus excluding these possibilities. The mainstay of treatment for mucosal melanoma is surgical resection. The surgical treatment of melanoma of the mucous membrane is more complex than the surgical treatment of cutaneous melanomas, and the prognoses of patients are in general poorer than for patients with cutaneous melanomas because of late presentation. In our case, because of the presence of distant metastasis, the patient began palliative radiation and chemotherapy. In conclusion, primary melanoma can arise in the sphenoid sinus. CT scan reveals early bony destruction associated with the lesion. MR imaging signal intensity changes and enhancement patterns may be similar to melanoma elsewhere and may suggest the diagnosis. Contrast MR imaging also helps in determining further extent of the tumor in the critical skull base area. Accepted after revision January 20, 2005.